As a self confessed nail geek, its virtually impossible for me to go in Boots or Superdrug without coming out with at least one new nail varnish. I am by no means a great nail artist, in fact I'm quite the opposite - where others spend their time carefully painting on their polish, I tend to whack it on in any which way and spend the time neatening them up with a cotton bud instead. For this reason I like polishes with a thick consistency and quick drying time. 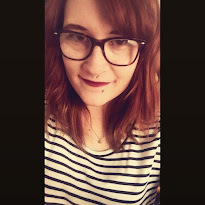 Collection 2000 Hot Looks are my usual favourites due to their cheap price and fantastic quality, and therefore I generally buy them in bulk! 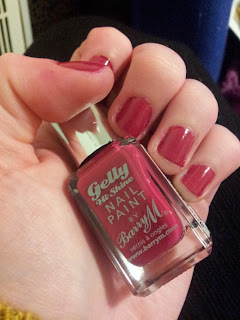 However, I'm quite partial to a Barry M Nail Paint every now and then, and their new Gelly Hi-Shine range caught my eye. There are a range of colours, and they promise to be thick and shiny - which is why I like the Hot Look range, because they are exactly that. I think this range is supposed to give the same finish as you would expect from a Shellac manicure so, at £3.99, you can't really go wrong. With this in mind, I decided to try them out and picked up a few different colours. The one I tried first was Pomegranate, I started out with a Natural Collection clear coat to make sure my nails didn't stain, as its quite a bright vibrant shade. After one coat, my nails were covered, the polish is nice and thick so I knew it wouldn't take many coats, however I applied a second just to complete the look. I finished with another coat of my Natural Collection clear polish, which was just force of habit, but I probably didn't need it. The hi-shine finish was fantastic and visibly more glossy than a regular polish, giving the illusion of a Shellac nail. The shade was beautiful, a really deep pink, but not too tacky, and the polish its-self dried in seconds. To add to this, I found that the polish was a lot more resistant to chipping than others, and therefore lasted longer, even with work and uni everyday, any chips were barely noticeable. I can't wait to try the other colours in the range and would definitely recommend them to others. A bargain at £3.99 and a fantastic cheaper alternative to Shellac. Definite must-have for nail geeks like me!